It’s the Seelbach Cocktail‘s extraordinary ingredient list that caught my eye. The Seelbach is a champagne-based cocktail, which in itself is uncommon—there are only a handful of champagne cocktails in the canon. And it includes a healthy dose of bourbon as homage to its Kentucky heritage. But the shocker is that it also includes seven dashes—seven—of Angostura bitters. But wait, there’s more: we need seven dashes of Peychaud’s, too. What th’…? Of course, it works, or I wouldn’t be writing about it here. Apparently champagne is a better friend to bitters and bourbon than I ever suspected. That unlikely pairing puts the Seelbach in a class by itself. It sidesteps the sweet and fruity profile of more commonly encountered “brunchy” champagne cocktails like Bellini and Mimosa; instead, it presents a drier, more businesslike flavor dominated by the whiskey and bitters. It has all the characteristics of a good aperitif, and is a fitting companion at the cocktail hour. The gorgeously red Seelbach was invented at Louisville’s Seelbach Hotel in 1917, but Prohibition ended cocktailing there, and the recipe was lost. The story goes that Adam Seger, the hotel’s restaurant manager, rediscovered the formula in 1995, and Gary and Mardee Regan convinced him to let them publish it in their New Classic Cocktails (1997). Build in the order given in a chilled champagne flute. Rub the orange twist around the rim of the flute, then add to the drink. The Seelbach is different from most Cold Glass cocktails in the respect that it’s “built,” not shaken or stirred on ice. Accordingly, it’s important to ice the glass (and the wine) before you build the drink. If you have no Old Forester, try substituting a bourbon like Bulleit, which brings a moderately high-proof punch of flavor that keeps the bourbon from being lost in the mix. Robert Hess recommends the very high proof Booker’s for the same reason. I’ve seen recipe variations that use less bitters, and others that suggest just washing the glass with the bitters and pouring them off. The person who invented the Seelbach was clearly experimenting with bitters, and making discoveries at the margins; certainly, the Seelbach is all about that huge dose of bitters, and that is the last part of the formula I would alter. It would be better to experiment with your bourbon or champagne than with the bitters, the hallmark of this drink. As for the champagne (or other sparkling wine), the “brut” characteristic is what you want in this drink. 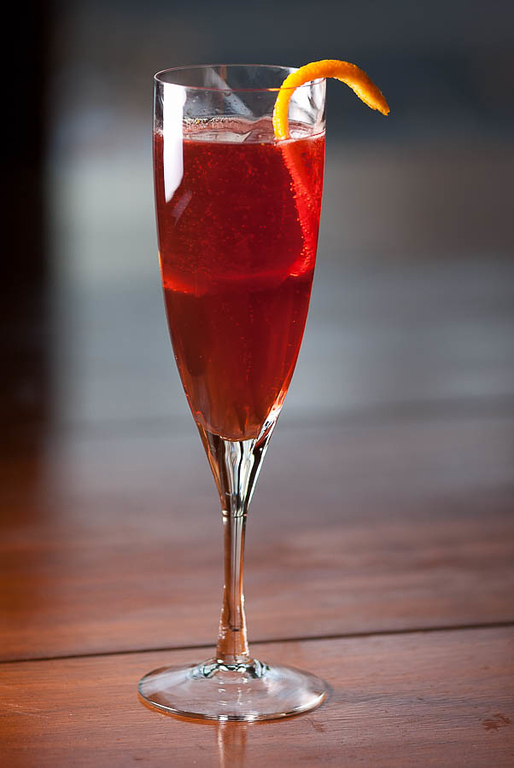 Crispy, light, and fruity sparklers won’t blend as well in the Seelbach. “Got bitters? — the Seelbach Cocktail” at cold-glass.com : All text and photos © 2011 Douglas M. Ford. All rights reserved. hmm… like a Christmasy champagne cocktail… love it. Yes, it is—I hadn’t thought of it that way. Spicy, red, a little wintry bourbon… Good spotting. I just tried this drink, form rough notes. I had sweet champagne (well, South African bubbly, I stirred with ice and strained to a coupe glass, and my Maker’s Mark didn’t quite have enough kick to shine through. But even with those mistakes, it was still a great drink. I kept wondering if I’d written ‘7 dashes’ instead of ‘7 drops’ by mistake. But no, against expectation, it works. Beautiful photo by the way. Der Seelbach Cocktail. Vom großzügigen Umgang mit Bitters.